An arrest for Driving Under the Influence (DUI) is a serious matter in California and carries fines and possible jail time. Long term consequences include establishment of a "prior offense" record, drivers license restrictions and greatly increased insurance costs. Our firm can advise you as to your rights and the various options available under the law in California. An arrest for DUI can be a frightening and traumatic event. Call Law Offices of Nelson R. Boylan, qualified and experienced lawyers for a FREE consultation and sound, practical legal advice. IMPORTANT INFORMATION: After a DUI arrest you have only Ten (10) Days to request a DMV Administrative Hearing regarding the automatic license suspension. Call us now for free information about DMV "Per Se" Administrative Hearings. There is no safe way to drive while under the influence. Even one drink can make you an unsafe driver. Drinking alcohol affects your Blood Alcohol Concentration (BAC) also referred to as Blood Alcohol Level (BAL). It is illegal to drive with a BAC that is .08% or more (.04% or more if you drive commercial vehicles; .01% or more if under 21). However, a BAC below .08% does not mean that it is safe or legal to drive. 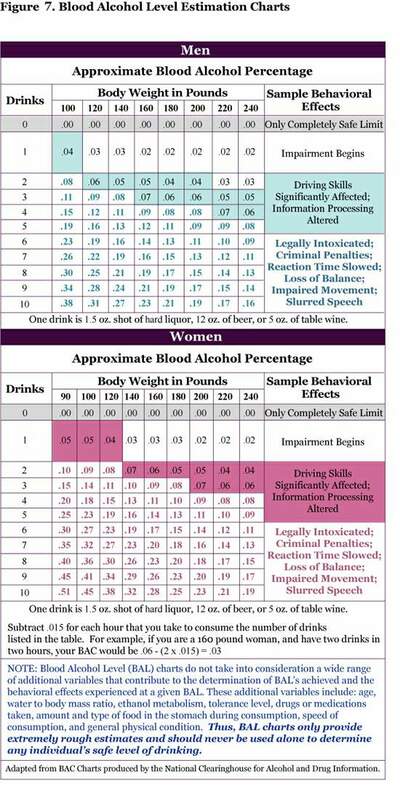 The charts show the estimated BAC zones for various numbers of drinks prior to adjustment for time. “One drink” is a 1 ½-ounce shot of 80-proof liquor (even if mixed with non-alcoholic drinks), a 5-ounce glass of 12% wine, or a 12-ounce glass of 5% beer. These “one drink” equivalents change if you are drinking ale, malt liquors, fortified wines, port, brandy, different proof liquor, or if you are drinking on an empty stomach, are tired, sick, upset, or have taken medicines or drugs. These charts are for educational purposes and general information only. When faced with a DUI charge (alcohol or drugs) you should always have your case evaluated by an attorney before pleading to the charge. There are various facts and circumstances which can affect the resolution of a DUI case and penalties imposes. You need to know about possible reduced or different charges available from the Court or the District Attorney based on the facts of your case. DON’T DELAY IN CONTACTING AN ATTORNEY! There is a 10 day deadline regarding your DMV license suspension hearing rights.